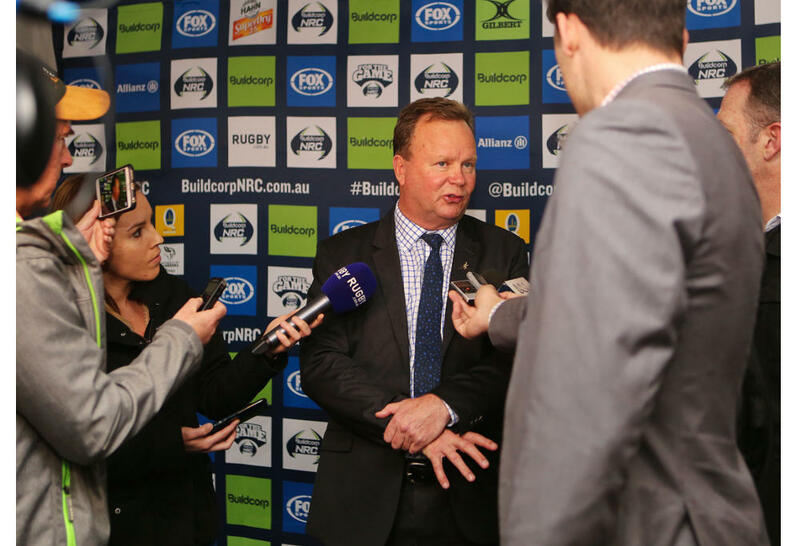 Pulver and the chairman of the ARU board, Cameron Clyne, attended the launch at a critical moment for the ARU. The heartland of rugby was up in arms against the ARU’s high-handed, secretive and incompetent handling of the important issues facing the game in Australia. The charge was being led by Brett Papworth. His argument was that club rugby was being denied resources and money that were needed to continue the growth of the game at the grassroots level. As well, Papworth and others made the case that it was the clubs who provided the Super Rugby players and the future Wallabies. For his pains, Papworth was subjected to nit-picking attacks from Pulver who refused to deal with the substance of the complaints. How could quality players be developed if the clubs, the nursery of these players, were deprived of the resources to do the job? That was what Papworth wanted to know. Pulver’s reply to this (which was never repudiated by the ARU chairman or other board members) was that the clubs “pissed away” the ARU money and that, presumably, there were better ways to spend what funds the ARU had at its disposal than essentially wasting it on the clubs. At the launch, Bob Dwyer made the case, knowing that Clyne and Pulver were in the audience, that the club was keeping its part of a bargain with the ARU by producing five of the Australian under-20s squad, numerous Super Rugby and Test players and the last two Wallabies coaches. There were impressive presentations from club officials about the way the activities of the club away from the rugby field were helping the players in their life off the field, including support for their university studies, apprenticeships and finding work. Neither Clyne nor Pulver, who seemed to be unrecognised by most of the people at the launch, responded to the matters raised in the presentation. In fact, there was no response as far as I can remember at any time after the launch to the matters Dwyer raised. So as the meeting broke up, I spotted Pulver sitting by himself. I went up to him and quietly asked him my question about the details of the Pocock package. There was a sort of under-stated “how dare you question me about this” in his manner. For me, this reply summed up everything that had gone wrong with the Clyne/Pulver administration of the ARU. They were running the show as if they were the only stakeholders. Other stakeholders like the clubs, supporters, the players and the rugby media trying to ensure that news and information about the game reached as many people as possible were to be ignored and even disparaged. We know now, but were kept in the dark about it then, that the ARU was under enormous financial stress when I asked my question. Yet I was told, even though I was a long-standing writer about rugby in Australia, that it was none of my business even asking the question about the Pocock handout. By implication, Pulver’s silence was an indication of his belief and practice that the rugby public, including the great clubs like Randwick, have no right to know how the game’s finances were used, or abused (in my opinion), with the Pocock handout. You could call this a decisive moment for me. I formed the opinion that the ARU board, its chairman and the chief executive did not have a clue about how the game should be managed, how the resources of the ARU should be used and what had to be done to keep the game relevant and vibrant in a tough commercial market. The ARU, it was obvious to me, were obsessed with secrecy. They wouldn’t discuss the facts about the Pocock handout. We never knew, either, when they have board meetings, or what was discussed and decided at those meeting. So I started writing a number of articles on The Roar about the need for the board, its chairman and its chief executive officer to go. When I started on this series of articles, there was a lot of resistance among some of the other influential rugby writers. I felt when I was writing these articles that I was something of a lone wolf who the pack hoped would slink away into oblivion. Some hope. The fact is that the pack has now joined the lone wolf. 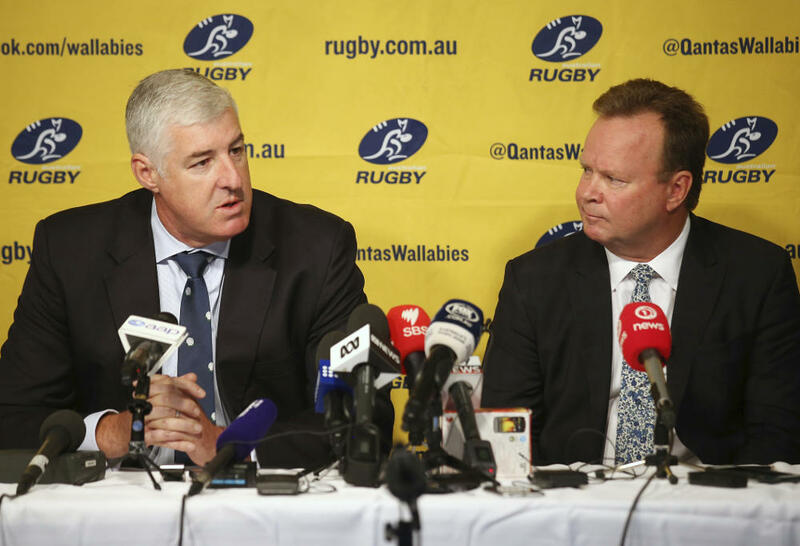 This is one of the more significant developments in the governance of rugby in Australia. It is, too, about time that the pack came to its senses on this issue. What has happened with the ARU over last weeks or so, with its incredibly inept handling of the Melbourne Rebels/Western Force Super Rugby franchise saga, which concerns the team to be dropped from the 2018 Super Rugby tournament, has validated all those articles. The interesting aspect of all this is that virtually every section of the rugby game in Australia now supports my argument that the ARU board is incompetent and totally out of touch with the crisis facing rugby in this country. Last week any veneer of support for the ARU board, its chairman and its chief executive was smashed like a canon ball ripping through a defensive wall of tissue paper. So senior Wallabies, together with two of the Super Rugby franchises, have joined the heartland clubs and schools in saying that enough arrogant, secretive incompetency is enough. Joining them, it seems to me, are two influential rugby writers, Wayne Smith of the Australian and Paul Cully of the Sydney Morning Herald. Both of these journalists scolded me (by inference) in the past for my attacks on the ARU board, its chairman and the chief executive. Both of them, it is fair to say, have been until relatively recently stalwart defenders of the ARU board and its decisions. Indeed, when I had a fiery private interview with Bill Pulver a week or so after I asked the David Pocock question, I put it to him that he maintained a secretive way of dealing with the media because he could leak favourable stories to Wayne Smith. Pulver did not deny this. On Saturday, Paul Cully wrote a damning column in the Herald, the title of which gave his game away: ‘It’s time for Australian Rugby Union chief executive Bill Pulver to go‘. This brings me back to the David Pocock question and its relevance to a player who should have been his successor, Sean McMahon. I had suggested to Bill Pulver that the ARU were paying David Pocock about $800,000 in his gap year of not playing rugby in 2017, and $1 million plus for each of the other two years, 2018 and 2019, through to the Rugby World Cup tournament in Japan. Someone like Sean McMahon, I would guess, would be paid about $250,000 at most for playing rugby this year for the Rebels and, presumably, for the Wallabies. No wonder Pulver didn’t want to divulge any information about the Pocock deal. It was the deal of the century for the player and possibly the worst deal of the century for Australian rugby. The point here is that McMahon, if he had been born in New Zealand, would have been regarded as the successor of Brad Thorn, the tough man in the pack. There is everything about his play (like Thorn’s), his fearlessness, his physicality, his inspirational surging power, his animal spirits and his love of contact, hard and meaningful contact, that the Wallabies desperately needed. The Wallabies, for the last couple of years, could have had their “Wallaby Thorn” but no one in the hierarchy of Australian rugby has had the sense to realise this. 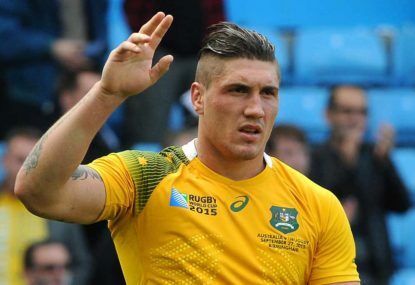 There is no doubt in my mind that McMahon is the future of Australian rugby. Last season, according to the statistics provided by Fox Sports before the Waratahs versus Rebels match, McMahon made 56 tackle busts (second best in the Super Rugby tournament), ran for 987 metres (second best) and made 135 runs a match (third best). He hasn’t been able to replicate anything like these statistics this season because he has missed most of the games through injury. 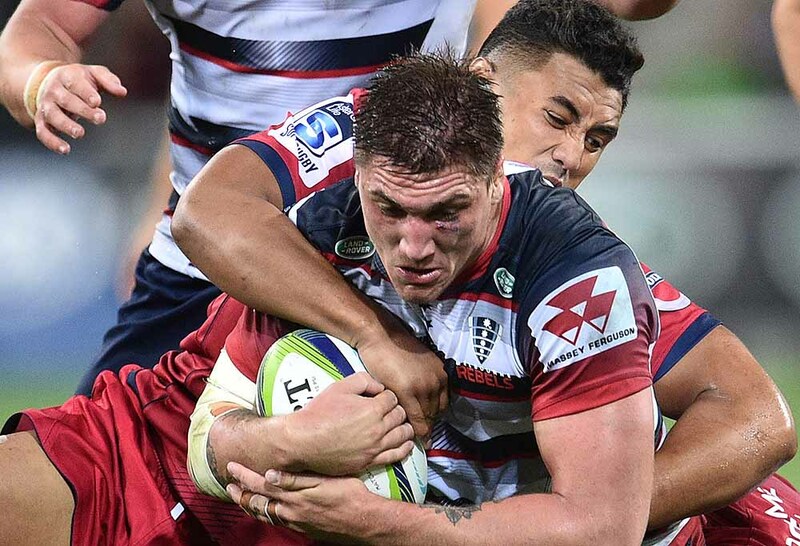 Wearing the number seven jersey, which is not his right position, he was out-played by a rampant Michael Hooper against the Waratahs on Sunday. He was strong early on and then faded. But if Michael Cheika has any sense he will pair Hooper and McMahon as the two breakaways for the Wallabies, perhaps playing them as right and left flankers as the Waratahs did with Hooper and Ned Hanigan on Sunday with some success. This was the traditional Australian system until it was superseded by the New Zealand open and blind-side system. This could be a deadly combination for the Wallabies. Pocock’s greatest days were years ago, in the 2011 Rugby World Cup tournament probably. Occasionally, as at Sydney when the Wallabies defeated the All Blacks before the 2015 Rugby World Cup tournament, he was capable of a great performance. But he was out-played by Richie McCaw in the final of that tournament. McMahon, on the other hand, hasn’t really been given a chance to launch what should be, or should have been, a fabulous Test career. McMahon as the Brad Thorn enforcer type for the Wallabies is something of a fantasy for Australian supporters. These thoughts were prompted by an article written by Wayne Smith in the Australian headed: ‘Japan deal would rule McMahon out of Cup‘. “It is understood McMahon has been disenchanted with Wallabies coach Michael Cheika, who handed him (McMahon) his Test debut against Wales on the 2014 Spring tour. Although Cheika raves about McMahon’s ferocity in training, hailing him as a model for the physicality he wanted in the Wallabies, he has started McMahon in only ten of his 13 Tests of which he has been in charge of the Australian team. “But it is believed that Cheika and McMahon met over lunch recently as the Australian coach tried to persuade him to put the Australian jersey ahead of the rumoured $1 million a season Japanese contract. So there we have it. The money that is being spent on David Pocock for his gap year is money that can’t be spent on keeping McMahon in Australia. The Japanese offer to McMahon, according to Wayne Smith, is around $1 million a season, about the same amount that is being paid to Pocock not to play in Australia this season. To sum up, the ARU, with Bill Pulver doing the negotiations, agreed to pay a veteran loose forward in Pocock three times more than a player who could be the catalyst to lift the Wallabies with his physicality and intensity on the field. This was irresponsible madness on the part of the ARU. It was also a preview of the muddle-headed, inept incompetence displayed by the ARU this season over a range of issues that is leading stakeholders to call (correctly) for the board and its chief executive to be booted out of their offices.